Golf is a funny game, isn’t it? On the one hand, it takes a very long time to play a game of golf, i.e. 4 – 5 hours. But on the other hand, a golf swing takes about a second to complete. 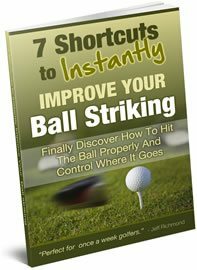 So if you want to hit the ball further, how should you attempt to do it? 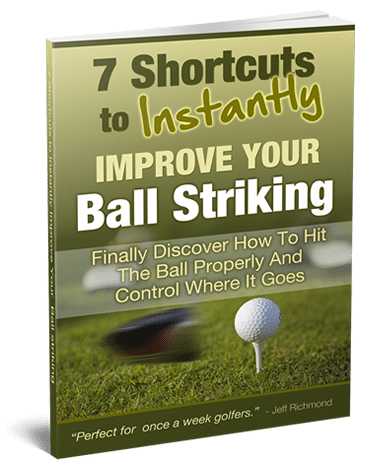 Well, each golf swing is a very fast movement and takes very little time, so….let’s take a look at other quick movement sports and see how they train. For this example we’ll look at running. At the extremes of running you have the super quick guys that do the 100 meter sprints. Then you have the marathon runners. Do you think a sprinter is going to train in the same way as a marathon runner? Of course they’re not! A sprinter is going to train to be explosive. A marathon runner is going to train for endurance. Seen as how the golf swing is an explosive movement you should train explosively to be able to swing faster. And here’s a classic example with sprinters that you can use to swing faster. Sprinters use something called ‘over speed’ and ‘under speed’ training. What is over speed training? Over speed training is when you do something at a higher speed than you normally would. A sprinter for example will run down a steep hill so they run much faster than normal. You can do something similar by swinging an object that is lighter than your driver. You should keep this over speed device between 10 – 20% lighter than your normal driver. And you need to swing this as fast as possible. What this is doing is letting your mind experience a movement faster than what you would normally do. So to help you swing faster you should use over speed training. Then you should also use under speed training. This is where you actually make the movement harder by using some resistance. An example of this with sprinters, is they run with a small parachute so that they are slowed down when they are running. In golf you can do the same thing by using a heavier golf club than you normally would. The weight of this should be between 10 – 20% heavier than your normal driver. So to help you to swing faster you should have an over speed device and an under speed device that are 10 – 20% lighter and heavier than your driver. You need to then swing these devices alternately and mix it up. Don’t get into a routine….you need to mix it up so your mind doesn’t get used to anything. Also, when you do this you shouldn’t hit balls. You just need to swing like you normally would, BUT swing as fast as you can. This is just one way to train yourself to swing faster, there’s many more things you can do that are found in this program. You can’t just do this one exercise I’ve given you today and expect to get the maximum swing speed results you can. Of course, doing this drill will be beneficial. But you can’t reach your full potential by just doing this, or even putting a bunch of drills together like this. You need to train your body to handle more speed, because your body can only handle so much, otherwise it will break. And your mind has safety mechanisms in place to only let you swing so fast. It knows your limits and it will only allow you to swing to a certain speed. So I repeat…you need to train your body to handle more speed. That includes doing flexibility, strength, power and speed exercises. When you get that mix right – watch out! Your playing partners won’t know what the heck happened the next time you play golf. To make that a reality go here and start this program. It gets my highest recommendation.